This was a MIB-intensive convention; we outnumbered the con staff 2:1, not including the fact that we began recruiting right out of the con staff into the MIB. I've reduced the photos in size; if you want to see a larger photo, click on it, okay? Also, if you're interested in reading the article that was written by the JHU student paper, the News-Letter, I won't stop you. Not that it looks like the reporter did any research about this year's convention, mind you...but I guess he had fun. 8^) I've put the pix from the newsletter at the bottom of the page, after my own shots. These shots basically go chronologically through the three day convention. We start off, conventionally enough, on Friday night. Here is one shot of the big multi-tribe Tribes game. Standing at left is MIB Mike Cowper; standing at middle is MIB Susan Rati, and standing at right is MIB Ralph Melton. Seated at right is our youngest MIB, Megan Cowper. Megan won this game of Tribes later that evening. 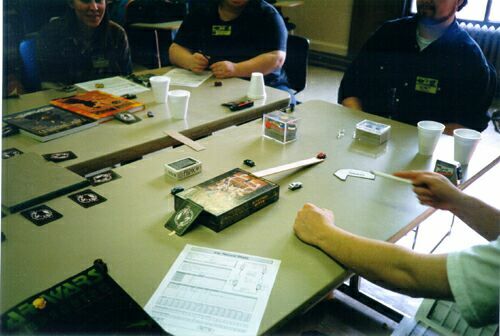 Here's the same Tribes game from later that evening. Standing at left once again is Ralph Melton; in the center, seated, is Our Founder (and, in his role as GM, the Great Ghod) Steve Jackson. Standing at right in the picture is MIB Steve Brinich. Saturday morning: gearing up for six hours of Killer. The theme: Kill Evil Stevie. Here, MIB Matt Lee defends Steve Jackson with his body. Not really necessary, as I was also a defending MIB. Matt, as you can see, is well armed. A good thing in a bodyguard. A fine selection of MIBs pose for a photo. Clockwise from left, Ralph Melton, Dan O'Gorman, John Sabean, Mike Cowper, and Megan Cowper. Beware the innocent-looking ones, they're the most dangerous. Gee, I wonder what game they're playing? INWO Line Editor Lynette Cowper and INWO God Steve Brinich playtest Illuminati:Y2K, the upcoming expansion for the newly re-released Deluxe Illuminati. Here, unfortunately, is a picture that didn't quite turn out. Jim Duncan sets up for his GURPS game. Right now, before it started, he was all alone. He collected quite a group...they gamed for about 8 hours! Kill Evil Stevie, continued: These folks walked past the INWO game, so I shot 'em with my camera. Matt Lee, Steve Jackson, John Sabean, and Megan Cowper. 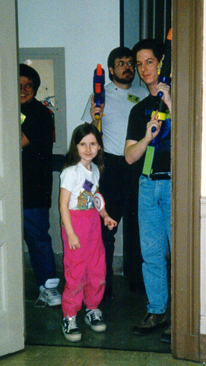 "Evil Stevie", at this point, was played by Megan; SJ was here as a bodyguard. Can'tcha see the big targets pinned to her? Here's a creative mind at work: components of his track include the Car Wars book in the lower left, Deluxe Illuminati at the center, Lunch Money cards, GURPS Discworld and a Deadlands book. Neat, eh? This game of Car Wars was run by a non-MIB. Alright, here's one big mess of MIB's and bodyguard MIB's (gamers who had been successful in Killing Evil Stevie and had been promoted). Top row, left to right: Mike Cowper, Ren Cowper, Ralph Melton, John McMahon, Seth Cohen, a bodyguard MIB, Steve Fritz, Dan O'Gorman, Steve Brinich, Jim Duncan, and John Sabean (with the big cannon). Middle row, same deal: Lynette Cowper, Lori Bossert, Brian O'Reilly, Brian Joughin, and Matt Lee. Bottom row: Megan Cowper and Steve Jackson. Unfortunately, we missed collecting Sarah Elkins and Susan Rati for this shot. Sunday, post-convention: There are too many possible funny captions for this. 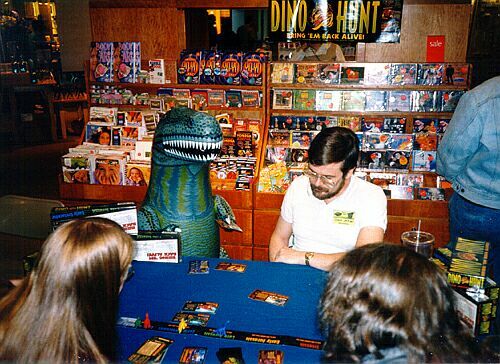 I'll settle with the facts: a friendly game of Dino Hunt, as a demonstration at the Nature Company in Towsontown Center. SJ won, of course. And one more shot, just for the record: me, Susan Rati, SJ and friend doing Dino Hunt in Towson. Woo hoo! What a day! This shot also ended up on the Daily Illuminator, later on. So, you all know that this one's been worked on for quite a while, eh? This won't be short, either. Better strap yourselves in. couple of confirmations back quickly that all would be well even if I wasn't there. Isn't planning ahead and multiple redundancy in staff wonderful? I thought you'd agree. Every event I was supposed to be in I had planned to run *with* other people, because I primarily wanted to be available for troubleshooting. This turned out to mean that I don't get many points, but that things ran smoothly. So who cares? Friday: Go visit my girlfriend. Turns out (whew!) that she might not be sick, but is in the hospital because the docs are ruling out all sorts of bad things. I get home and wait for my houseguests to arrive. Turned out they'd be late, so it gave me time to relax. Didn't want to tie up the phone line with email, so didn't find out until late Friday night that I'd gotten an email saying "It's 5pm. SJ is here. Where are you???" 8^) Luckily, I didn't expect anyone to be psychic about when my houseguests would arrive. And so it goes. I went to school to print up more MIB stuff that I thought I'd need, and got adopted by a cat on the way back. No, I don't have a name for her yet. We got to the convention right about 9pm, when I was supposed to be running Tribes. I'd wanted to be there earlier to scope out the place and do other stuff, but that's the way it turned out. Turns out that it didn't matter if I'd been there or not, because our professionally competent MIBs had everything well in hand. Tribes: Got to the room, SJ and Mike Cowper were making it go. I sat down, we all got started, and the fun began. We had two full tables (8 per table) running at any given moment. It only took an hour for one group to not be running simultaneously with the other. The tribe I was in kept having more babies, so the other tribe had less paperwork to keep up with and moved ahead faster. As far as I know, it all went smoothly and folks had a great time...I kept giving my character (Lola) to other people to play so that I could get up, walk around, and introduce myself to people. Yes, I had not met in person almost half the MIB's in attendance. It was a pleasure and an honor to meet SJ, the Cowper clan, Susan Rati, Dan O'Gorman, and Brian Joughin. I'm still wondering what happened to Ian Homeyard; he didn't make it and no one seems to know why. Oh, and in case anyone was wondering, when you look in the dictionary under 'cute', you find a picture of Ren Cowper. surpassed attendance for *all* of last year's convention. Isn't publishing on the Daily Illuminator a wonderful thing? Oh, as I go through this report, please remember: I didn't see everything, and even the things I saw I didn't always see for long enough to report coherently. My apologies for errors. a square and that you could walk in, well, circles, all the way around) while Matt Lee and Steve Fritz dealt with the retail in room 44. 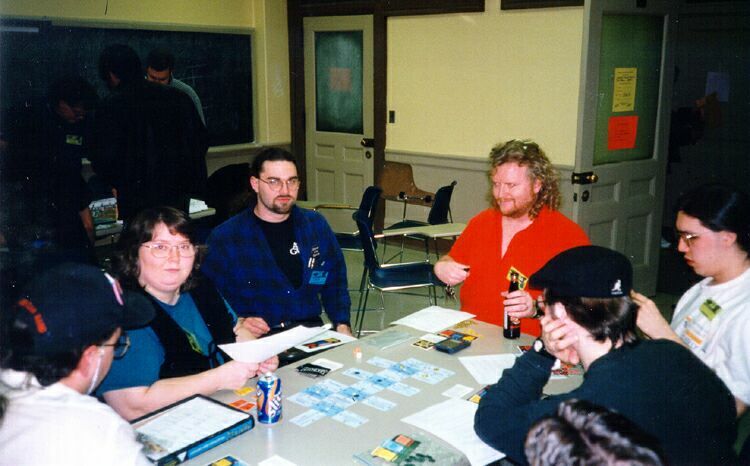 The Killer crowd looked in on Steve Brinich playtesting Illuminati Y2K with Lynette Cowper and Brian Joughin; SJ stopped in on Susan Rati's GURPS Goblins game and played for a bit as a guest NPC villain; Ralph Melton's melding of Toon and Kill Dr. Lucky ("Make Dr. Lucky Fall Down", published as an article in Pyramid), and a big group of folks (you know who you are) doing both sealed-deck INWO and One-Big-Deck INWO (winners of the two simultaneous games of sealed-deck INWO were Ralph Melton and yours truly). 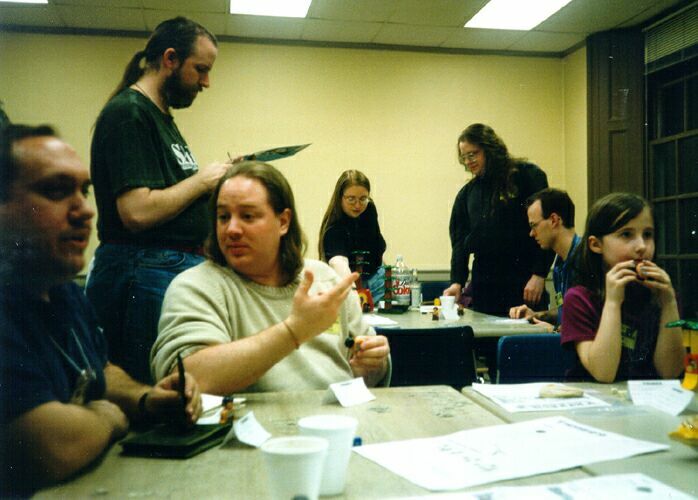 Jim Duncan ran what was *supposed* to be a 4-hour GURPS scenario, but his people were still going strong after 8 (eight) hours. Damn. Killer went, er, interestingly. The players ranged from the hideously stupid to the fiendishly clever. I shot one kid running at me with a gun, screaming...and I wasn't *ever* Evil Stevie. Sheesh. The first kill went to someone who admitted that he worked for the Secret Service. The second went to a successful distraction, and the third went to sheer cleverness. Then we had an amusingly large distraction (Steve was killed due to a huge distraction, half a dozen Killers assaulting from the front while some attacked from the back). There were masking-tape outlines all over the place. By the way, not all of the bodyguards were MIB's. 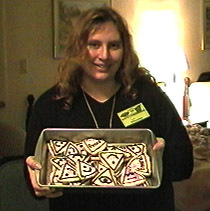 The MIB Ladies Auxiliary was well represented in the person of Lori Bossert, and we awarded temporary MIBships to successful Killers. Perhaps the most dedicated bodyguard was John Sabean, who did all six hours of Kill Evil Stevie. We got a group picture of the MIB's right afterwards, and I feel bad that I wasn't able to collect them all from the games they were in. Perhaps the most amusing kill went to Fuzzface, who had been a bodyguard for several hours before stepping out to do INWO, who shot Megan Cowper in her role as Evil Stevie. She got her revenge not too far later on Fuzzface when he played as Evil Stevie. ...Sunday! I didn't carpool with Ralph and Lori this time, in order to make it there in time for my morning Dino Hunt game. This was a problem as I'd left my Dino Hunt stuff with Ralph the previous night, and it was in his van, back at my place. D'oh! Luckily, I was not game-free, and managed to stall until Mike and Megan came in with their cards. Room 44 got unlocked, and I retrieved SJ's Big Box o' DH. We had two simultaneous games of DH running, one with 6 players and one with 4. Winners got DH boosters and DH expansion sets. Dan O'Gorman ran Awful Green Things From Outer Space with the aid of Sarah Elkins, Lynette led Steve Brinich and others in In Nomine, and Susan Rati sat in room 44 and administered Silicon Valley Tarot readings to a hungry populace. The room was packed up, and all disembarked the premises. 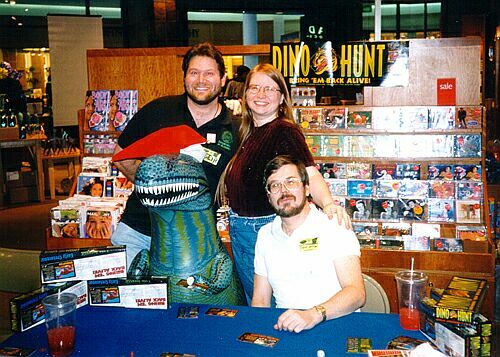 SJ, Susan and I traveled to the Towsontown Center Mall, where we demo'ed Dino Hunt at The Nature Company for about 3 hours. My first store demo, SJ said that it was successful even though traffic was low. I hope the pictures we took came out. 8^) Yes, I had my camera with me for most of the convention, and I should have gotten shots of most things. I'll get it up on my webpage as soon as I can, so that all can see. Too bad I couldn't get everything. about making sure they're good to go. It's tough to find ways to vouch for total strangers without taking the time to verify their skills beforehand. However, some of the people there who were running SJGames stuff and weren't MIB's looked to be quite competent, so it'd be a damn shame if we didn't get some recruits out of this. Thanks, everyone. It was great. Good job! 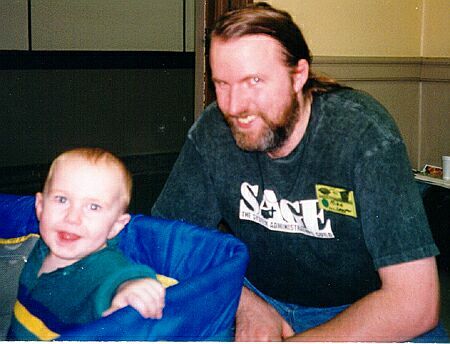 Want information about Balticon '99?